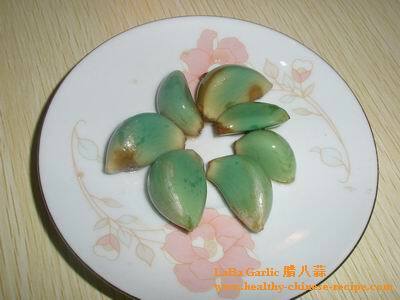 Laba Garlic Recipe (Laba Suan) is made at 8th(LaBa) day of the 12th month in Chinese Lunar Calender, which is regarded as the coldest day in Nothern China. This traditional Chinese food is always served with meat or greasy food. 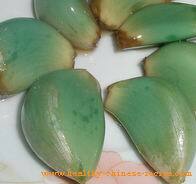 Nutrition Benefit of Laba Garlic: Promoting appetite. Removing grease. Improving digestion. Anti-aging. Anti-cancer. 1. 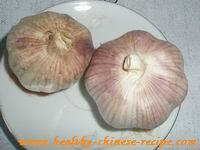 Buy garlic, better is pink peel. 2. 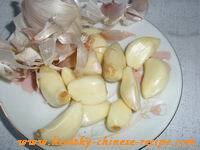 Peel, clean garlic cloves. 3. Add in a closed bottle. Add sugar. 4. 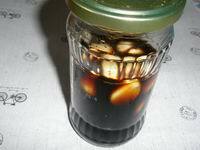 Fill in vinegar. Cover. 5. Put in a cold dark place. 6. One or two weeks later when the garlic becomes green you can serve. Tip: Choose brown or white rice vinegar so that the color is beautiful. Note: The green color is healthy. Don't worry.